1 The term “Adolescence” literally means “to emerge” or “achieve identity”. Its origin is from a Latin word “Adolescere” meaning, “to grow, to mature”. It is a significant phase of transition from childhood to adulthood. A universally accepted definition of the concept of adolescence has not been established, but WHO has defined it in terms of age spanning between 10 to19 years. In India, the legal age of marriage is 18 years for girls and 21 years for boys. There is a high correlation between the age at marriage, fertility management and family health with education. 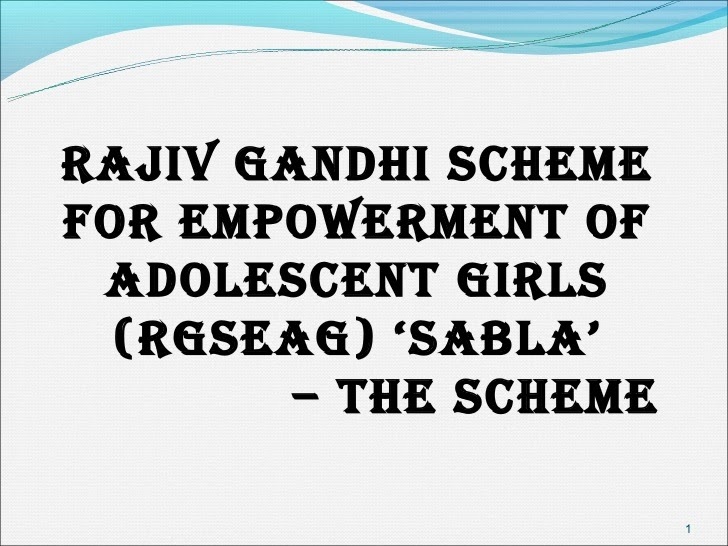 Having regard to this and other considerations, for the purpose of this scheme, the girls in the age group between 11 to 18 years will be considered in the category of adolescent girls. The objectives of the Scheme are toi. ii. Improve their nutrition and health status. iii. Promote awareness about health, hygiene, nutrition, Adolescent Reproductive and Sexual Health (ARSH) and family and child care. vi. Provide information/guidance about existing public services such as PHC, CHC, Post Office, Bank, Police Station, etc. The Scheme would cover adolescent girls in the age group of 11-18 years under all ICDS projects in selected 200 districts in all the States/UTs in the country. In order to give appropriate attention, the target group would be subdivided into two categories, viz. 11-15 & 15-18 years and interventions planned accordingly. The Scheme focuses on all out-of-school adolescent girls who would assemble at the Anganwadi Centre as per the time table and frequency decided by the States/UTs. The others, i.e., the school going girls would meet at the AWC at least twice a month and more frequently during vacations/holidays, where they will receive life skill education, nutrition & health education, awareness about other socio-legal issues etc. This will give an opportunity for mixed group interaction between in-school and out-of-school girls, motivating the latter to join school. Rs. 3.8 lakh per project per annum will be provided by the Government of India to States/UTs which will include cost of training kit at each AWC, Nutrition and health education, Life Skill Education, vocational training (tie up with NSDP), IEC, flexifunds for transportation, printing of registers, Health cards and referral slips. Actual expenditure in each project may differ from project to project depending upon population, topography and number of villages and the releases will be made depending upon actual expenditure.